El Mercurio, the oldest newspaper in Chile, has been owned and operated since 1849 by the Edwards family. 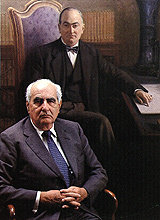 Its current owner, Agustin Edwards Eastman, has controlled the journal since 1956. With editions published in Santiago and Valparaiso, as well as twenty regional editions, Chile's "newspaper of record" is also the largest news organization in the country. The new film by Ignacio Aguero, AGUSTIN'S NEWSPAPER follows journalism students from the University of Chile as they launch an investigation into the work of the newspaper, and its reporting of and role in their country's political history, in particular around the election of Salvador Allende in 1970, the violent coup against him in 1973, and the subsequent seventeen years of the military regime. AGUSTIN'S NEWSPAPER features archival footage, interviews with former editors, journalists and other staff members at El Mercurio, Pinochet's political advisor and press secretary, relatives of political dissidents who were "disappeared," as well as John Dinges, former Washington Post correspondent in Santiago. Together, the students and the film dig into the particulars of several key events and their coverage in El Mercurio. They also look into relations between the owners and managers of the newspaper and Chilean political parties, the church, military, secret police, and the CIA. In the end, through its attention to the details of one country's journalistic history, AGUSTIN'S NEWSPAPER raises profound questions not only about the role and responsibilities of Chile's most important newspaper, but of all those who control or manage the dissemination of information and the reporting of news in every country.